People born specifically on the 12th of January are usually a little more sociable and compromising than the majority of typical Capricorns. This could be due to the influence of the planet Jupiter that rules this particular day you were born. You have the usual sincerity and resoluteness of your Goat zodiac sign but you are friendlier and more diplomatic in your approach to others. If you have this birthday you are able to absorb and understand information quickly and often have a great love of reading and learning. As you are quite outgoing you like to socialize and this is the time when people will probably encounter your witty sense of humor. Individuals with a January the twelfth birthday can also be rather outspoken and sometimes need to think before voicing their opinions. Although you like to speak your mind you are also an excellent listener who can be relied upon to not repeat confidential things. With career choices a person born on the twelfth of January will be selective as they need a job that has plenty of variety. You are often unsure of your abilities and may have to try several occupations before you find work that you enjoy. You are highly versatile and capable of most tasks that are not too mundane but you will expect and seek a generous salary. Individuals with this particular birth date may have difficulty managing their finances as they adore spending money. You should ensure that you discover a fine balance in your incomings and outgoings to avoid getting into debt. Like an average Capricorn, the person born on the twelfth day of January is typically somewhat reserved when it comes to talking about their feelings. Despite this, you have a strong desire to feel loved and appreciated and so are prepared to take a chance on love. You are very affectionate and will display great loyalty and understanding towards a partner when in a long term committed relationship. It could take you a while to learn to trust and talk openly to a soul mate and you will not be pushed into doing this before you are sure you are ready. You tend to look for someone who has the same degree of sociability and intellect as well as similar interests and aims in life. As you mature and maybe become a parent you will often naturally attain a less constrained flow in the way you relate emotionally. Any minor health problems experienced by those born on January 12th are most often due to bad dietary and other habits you may have acquired. You generally have a good constitution but also a tendency to pick up negative practices like smoking or fads in your diet. These may cause you to suffer from little ailments as your body shows its displeasure. You should pay attention to these bodily reactions if you wish to retain your strong healthy condition. Taking in enough fluids is also important for you as you are likely to be a person who dehydrates quickly causing headaches and fatigue. Your main strengths of character are in your friendly diplomacy and your possession of a sincere and determined attitude. You are also very dedicated to things you believe in and this is inspirational for others. Those of you born on January 12th have a few weaknesses within their otherwise amicable personality that are worth mentioning. These are your tendencies to be too giving for your own good on occasion and being prone to preoccupation and sometimes daydreaming. If you can manage to direct your generosity to causes not involving money it could help you keep your finances in better order. 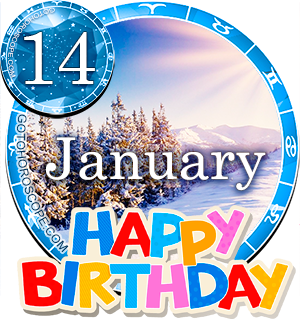 Being born on the 12th of January means you are bestowed with much perseverance and will usually have a well thought out plan for acquiring success. You work hard and are easily able to learn from your failures, pick yourself up and try again in the hope of achieving any dreams or goals that you have decided to pursue. Your ambitions will be probably not only be focused in your work, they can be concentrated in all areas in life. You are one of the few Capricorns who recognize that there is much more to living than just working and so you frequently dream of the things you wish to do in your spare time. As you were born on the twelfth day of the month your date of birth has the digits 1 and 2 adding up to a Root number of 3. The keyword for this numerical link to your birthday is 'Innovation' and could be an association to your brilliant way of coming up with practical solutions to problems. The Tarot card connected to your birthday is the 12th card in the Major Arcana The Hanged Man and signifies your deeply thoughtful nature. January the twelfth birthdays have the lucky gemstone the purple Amethyst as an attractor of good fortune. You should wear it close to increase your luck and happiness. The planet Saturn is the main planetary influence over Capricorns and decides some parts of your personality. The actual day you were born, the twelfth of January, is astrologically influenced by Jupiter. So your individual traits are believed to be jointly determined by the forces of these 2 celestial bodies. Your tactful and benevolent mannerisms and your devotion to important issues gain you many friends throughout life. Your determination and diligence are qualities that will allow you overcome obstacles and build solid foundations for your future. One final thought to ponder for people born on January the 12th is that it is not selfish to stop and consider your own needs every now and then. Was born on 12 January and it's a good number. This all is spot on I have tried to obtain a goal and have failed, I was very disheartened by it by I have not gave up on it I will keep trying to persevere and reach my goal. It is really closely related to my life . anyone has a source of jan 12 male/female actual definition or even races source. It is so true, I am also born in January 12th. I have failed a couple of times but still dream of achieving it. i know!!! i am wondering if i met the writer of this cause....dang....nailed it! I know a guy born on this date. He is super logical and intellectual and it seems like he has no intuition at all.